Chemistry: Cu19SO4Cl4(OH)32 - 3H2O, Hydrated Copper Sulfate Chloride Hydroxide. Connellite is a classic Cornwall mineral. 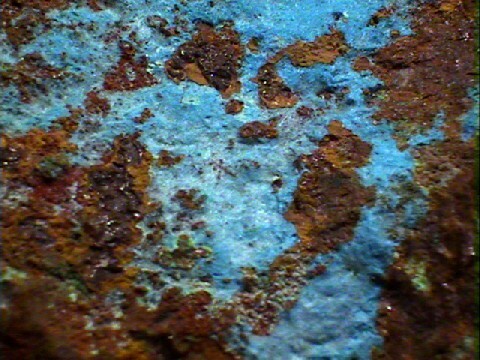 It has a deep blue color and is often associated with other copper minerals yielding beautifully colored specimens with various shades of green and blue. Although it is somewhat rare, specimens of connellite are available from time to time; for a price. They are well worth the price though, as they rival azurite's color and have a unique acicular (needle-like) to fibrous habit. Microcrystals are particularly appreciated as the diminutive size of the crystal does seemingly nothing to diminish the intensity of the color. Connellite is named after a Scottish chemist; A. Connell. When first discovered in the 1790's at Wheal Gorland in Cornwall, connellite was thought to be an arsenic of copper. It wasn't until the 1850's that connellite was properly identified as a copper sulfate. Connellite is related to the nitrate mineral buttgenbachite. The two minerals are isostructural and share the same chemistry, except for the primary anion group. Connellite is a secondary mineral found in some unusual oxidation zones of copper deposits. When available, specimens should quickly be purchased as they will soon be a treasured addition to anyone's collection. Color is deep blue to a more rare, blue-green. Transparency: Specimens are mostly translucent to individual crystals being transparent. Crystal System is hexagonal; 6 2 2. Crystal Habits include acicular to fibrous crystals arranged in tufts, layers or radial aggregates. Specific Gravity is approximately 3.4 - 3.5 (slightly above average for non-metallic minerals). Associated Minerals include quartz, azurite, cuprite, brochantite, caledonite, atacamite, paratacamite, paramelaconite, malachite, cornubite and chalcophyllite, among others. Notable Occurrences are limited to the Wheal Gorland and other mines of the Wheal Providence, Cornwall, England; South Africa and the mines of Bisbee, New Cornelia, Mammoth-St Anthony and Copper Queen of Arizona, USA. Best Field Indicators are crystal habit, color, associations and locality.